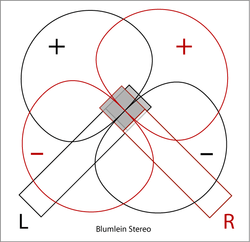 The Blumlein technique. | Are you drowning or waving? Bush Days — You’ve got to hand it to Gavin Rossdale, because he’s obviously the biggest music fan. Not only is his musical repertoire vast and diverse, but his knowledge of the industry and his ability to see the potential in people to aid him in producing his vision for music is matched only by the likes of Kanye West. Although it only fed fuel to the fire that were Nirvana comparisons in the 1990s, one of the most brilliant moves that Rossdale ever made was hiring Steve Albini to record Razorblade Suitcase for Bush in 1996. Though Albini has produced countless records (and the man’s schedule never, ever has any time off being his touring and recording gigs), it was never really fair that Bush detractors were able to close in on the fact that Albini produced In Utero; I’m sure that if that connection weren’t so blatant, the media would still have Kevin Baconed their way to one, but anything meant to detract from that album admittedly saddens me. However, if you’ve ever caught yourself wondering why Razorblade Suitcase is such a brill record, or wondered why it sounds so good, I have three words for you: the Blumlein technique. Invented by Alan Blumlein, the principle behind it is the taking of two microphones and pointing them at each other on an angle. Playing live in a room, the two microphones combined will pick up the sound in a way that compliments each other, creating a complete record of the sound in a given space by working in tandem to capture sound from all angles (further techniques include pointing one upward, the other downward). And while the technique itself is unparalleled in its ability to capture sound and create a sense of space, Albini is further genius for two other principles in his work — the fact that he insisted on recording Bush live-to-tape (though Rossdale admits there are a few overdubs in the end result), and his record-loud-to-play-loud principle. Which is to say, his preference is to record the music very loud, to ensure that its playback at loud volumes is optimal, as opposed to the music or signal breaking up when the volume is increased. Which is why Razorblade Suitcase is chemically the strongest Bush album to date (to my mind, at least) — it’s alive. To see what I mean, turn it way, way up the next time you listen to it. You can hear each silence in “Greedy Fly” crackle with the air in the room, the hum of the amplifiers. You can see the look on Nigel Pulsford’s face as he blisters through the solo in “Cold Contagious”, hear the pain in Rossdale voice in “Mouth”, every second and every note tells another story and layers in the context of the work in dynamic ways that only become more pronounced when the volume is increased. The album breathes, and brings you right into the room with the band. Razorblade Suitcase is a real gift of a rock and roll record, a complete capsule of time and space and energy. Not only would fans benefit from more artists producing their craft in such a way, but so the artists would, as well. ← Video comparison: a study.